7:30 First Floor Dining, First Floor Booths, Mezz Booths & West Rail SOLD OUT! This American stand-up comedian, well-known for her self-deprecating style, her razor-sharp wit, and spontaneity, has been making audiences laugh for more than 25 years. Poundstone grew up in Sudbury, Massachusetts and by the time she was nineteen was traveling on a Greyhound bus across the country – stopping in at open mic nights at comedy clubs as she went. She credits her kindergarten teacher, Mrs. Bump, with being the first one to spot her comedic talents. Bump wrote in a letter to Paula’s parents: “I have enjoyed many of Paula’s humorous comments about our activities.” In 1979 Paula began nurturing her standup comedy talent as part of the Boston comedy scene, and then moved to San Francisco where she continued to flourish. By 1990 she’d relocated to Los Angeles and had starred in several comedy specials for HBO, as well as appeared on Saturday Night Live when friend and mentor Robin Williams hosted the show. Paula’s first one-hour HBO special, “Cats, Cops, and Stuff.” made her the first woman to ever receive the Cable ACE for best standup comedy special. She also starred in a self-titled talk show series for HBO (for which she won her second Cable ACE Award for Best Program Interviewer, beating out other, more recognized names in that field.) In 1992, Poundstone forsook what she considered the ‘staid’ 5-minute standup set on late night talk-shows for something she thought would be more real with the audience and filed memorable field commentary of the Presidential Election for the Tonight Show with Jay Leno. This led to her own show on ABC, aptly named, “The Paula Poundstone Show”, and behind-the-scenes coverage of that year’s EMMY Awards for which she was critically acclaimed. During this time, she also became the first woman to perform at the White House Correspondents dinner. By the mid-90′s, Poundstone had shifted her performances from comedy clubs to performing arts centers and theatres where her interactions with the crowd became the stuff of legend. In 1996, Paula taped her second hour special for HBO, “Paula Poundstone Goes to Harvard,” – the first time that elite university has ever allowed it’s name to be used in the title of a television show. Paula’s off-kilter sensibility and impeccable timing made her a perfect fit for NPR’s “oddly informative”, weekly news quiz program, “Wait Wait…Don’t Tell Me,” which she joined as a regular panelist seven years ago. Hosted by Peter Segal, the show is broadcast in 50 states and gives Paula a chance to match wits with some of today’s leading pundits – not to mention interact with some of the people at the forefront of our nation’s eyes, including Supreme Court Justice Stephen Breyer and White House Press Secretary Tony Snow. Around the same time as her Bravo special, Poundstone released her first book, There Is Nothing in this Book That I Meant to Say. Described as an autobiography that is “part memoir, part monologue,” the book intertwines historical biographies with anecdotes from her own life. 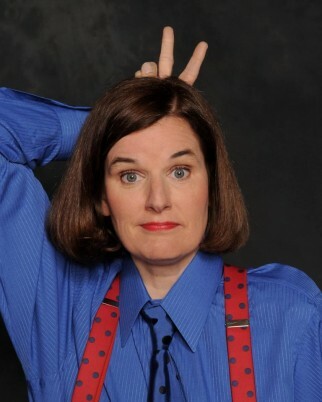 Poundstone released her first comedy CD, “I Heart Jokes,” in 2009.